The POB-Servo is a servomotor module. Manage up to 20 analogic servomotors by setting speed, position. A good choice to build an hexapod or any kind of mechanic that needs many servomotors. 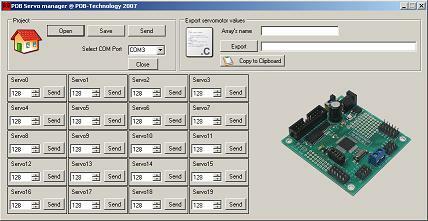 A tool to manage the servomotors connected to the POB-Servo boards. * Open & Save servomotors positions. * Send all servomotors values or one by one to the POB-Servo board. * Export values as a C array format to use in your own programs. Manage 20 servomotors and make your robot alive. 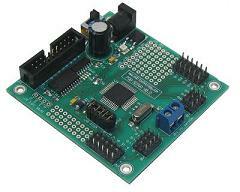 This small board has been designed to easily enter into any robot that needs many servomotors. o Position : data between 1 and 255.
o Speed : data between 1 and 7.
o 1 power connector for the servomotors. All the servomotors use the same power connexion. The switch on the board manages the power for the logical part not the servo power. The POB-Servo and the POB-TinyProto have the same size, so they can be easily added together.